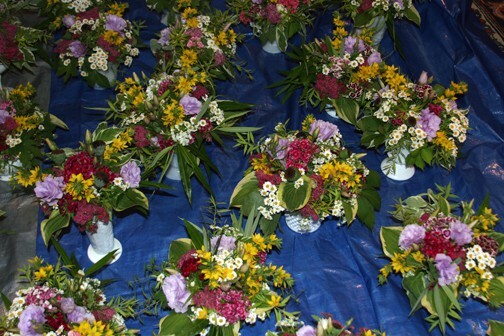 I spent the day working on the table arrangements for Kate’s wedding. Here are my thoughts, after completing 45 of the 60 centerpieces. I don’t know how any professional florist manages unless he/she has a full time massage therapist on staff. My upper back is killing me. Thank God for feverfew. It self seeds everywhere and is the perfect filler for bouquets. Fifty Flowers, the on-line company that I ordered roses, Lisianthus. Bouvardia and Trachelium from totally has it’s act together. I’ve used them twice and will order from them again in a heartbeat. There are more flowers than there are hours in the day. I haven’t had to cut as much from my garden as I thought I would, but it takes longer to put an arrangement together than I planned for. 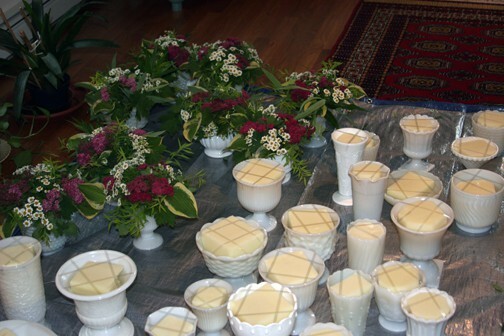 Fortunately, there is time to complete the remaining bouquets in the morning. I’m so blessed to be able to create these for my dear friend’s daughter. She’s a special young woman who deserves the most wonderful flowers. I’m also lucky to have a friend helping me with this…now if I could just find time for that massage therapist. Tomorrow: The larger arrangement, bride and bridesmaids’ bouquets, corsages, boutonnieres and more. 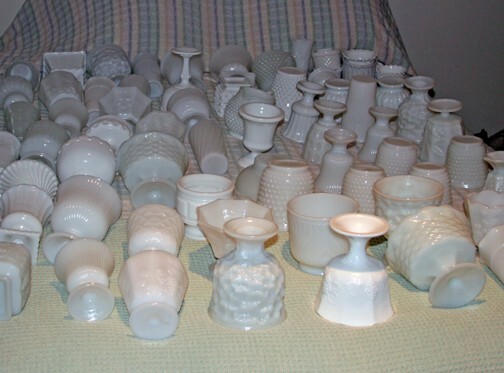 The Fort Knox of milk glass - 60 assorted small and 4 larger vases. Yesterday I filled all the vases with oasis. Since the regular, green Oasis would have altered the look of the milk glass, I used Ivory Oasis. Then today Pamela and I started filling these containers with greens and flowers. The arrangements are coming out beautifully. I added lavender Lisianthus from Fifty Flowers, but all the other ingredients come from my garden. The flowers include sweet William, Spirea (Magic Carpet, Double Play Artist) hosta leaves, Lysimachia punctata, roses, feverfew, Spirea Ogon and Salix foliage.